A man has been jailed for 12 years for killing a farmer whose Land Rover he was trying to steal. Ashley Squires, 22, pleaded guilty to the manslaughter of Michael Boffey at his Warwickshire farm last August. Squires, of Styon Road, Leicester, was told by the Birmingham Crown Court judge that his sentence reflected the sense of outrage felt by the public. His brother Frederick, 24, was given five and a half years for assisting an offender and conspiracy to steal. The court heard Ashley Squires committed the offence after being freed early from a 42-month sentence for previous offences. Judge John Saunders QC, Recorder of Birmingham, said: "The public justifiably expect that when a criminal kills an innocent person in the course of carrying out a criminal enterprise, that long sentences must follow." Mr Boffey, 61, was struck by the Land Rover at his Withybrook farm moments after Squires had tried to run over a female farm worker. He died from massive head injuries. 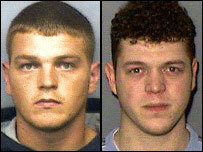 Squires and his brother had targeted at least seven other farms before and after Mr Boffey's death, the court was told. Judge Saunders said the pair spent 20 August driving across two counties trying unsuccessfully to steal vehicles from farms. They finally succeeded in getting a Land Rover at Mr Boffey's farm, near Rugby. Mr Boffey was working in his office at the time with employee Christine Russell and they both ran out to stop the theft. Mrs Russell was able to jump out of the way, but Mr Boffey was knocked over and crushed. Judge Saunders said: "Only Ashley Squires knows how that collision occurred as no third party witnessed it. "This is a very serious case. A human life has been needlessly wasted." Speaking outside the court Mr Boffey's son, William, said he could not believe Ashley Squires had been released from prison early. Squires would have still been in prison at the time of the offence if he had not been released. Frederick Squires had also been in prison for similar crimes. Words could not express the sadness we feel and as a family we will never recover, he added.